Dimitris Kyriazakos at Ekka Yachts has contacted me to say that he's listed the 24.73m motor yacht Alin for sale. 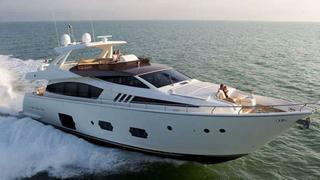 Delivered by Ferretti in 2010, Alin is a flybridge model with a fixed hard top. Accommodation is for eight guests in four staterooms while twin 1,800hp MAN engines give her a cruising speed of 27 knots. Alin also features LED lighting throughout. Lying in Athens, Greece, Alin is asking €3.2 million, VAT paid.